The Constitution of Ireland, enacted in 1937, is the basic law of the state. It provides the framework for the separation of powers between the legislature, executive and judiciary; the courts structure; and the fundamental rights of Irish citizens that are enforceable through those courts in addition to those prescribed by the legislature. Under Article 29 of the Constitution, EU law applies and shall not be invalidated by any provision of the Constitution. Civil claims up to €15,000 are dealt with in the District Court; claims up to €75,000 are dealt with in the Circuit Court (€60,000 for personal injury actions); and the High Court has an unlimited monetary jurisdiction. The new Court of Appeal has the jurisdiction that was previously vested in the Supreme Court and is the default court for all appeals from decisions of the High Court and its decision will, except in certain limited circumstances, be final. The Supreme Court will continue to exercise the function of an appellate court, dealing with cases that involve issues of general public importance. The Commercial Court is a division of the High Court dealing with commercial disputes with a value of over €1 million. Intellectual property disputes and appeals (or judicial reviews) of a regulatory decision may be entered into the Commercial Court list regardless of the value of the case. Application for admission is made by way of motion to the Commercial Court, grounded on the applicant’s affidavit and a certificate from the applicant’s solicitor. There is no automatic right for any case to be admitted to the Commercial Court list. Statutory tribunals are also in place to deal with specialist disputes and there are various alternative dispute resolution (ADR) mechanisms available, including arbitration, mediation, conciliation, expert determination and adjudication, for resolving disputes either without recourse to the courts or within the context of existing proceedings. The Court of Appeal was established on 28 October 2014 and has the jurisdiction that was previously vested in the Supreme Court, the Court of Criminal Appeal and the Courts-Martial Appeal Court, the latter two courts having been abolished by the Court of Appeal Act 2014. This effectively means that it is the default court for all appeals from decisions of the High Court and its decision will, except in certain limited circumstances, be final. Only in exceptional circumstances, and subject to the Supreme Court’s own ‘leave to appeal’ requirements, will it be possible to bypass the Court of Appeal and to bring a ‘leapfrog appeal’ directly to the Supreme Court. It is anticipated that the Court of Appeal Act will have a significant impact on the current waiting lists and will greatly improve the overall efficiency of the Irish court system. The Court of Appeal Act 2014 made substantial amendments to the Rules of the Superior Courts 1986 (RSC). Following commencement of Part 3 of the Courts and Civil Law (Miscellaneous Provisions) Act 2013 (the 2013 Act) on 3 February 2014, the District Court now has a monetary jurisdiction of up to €15,000 while the Circuit Court has a monetary jurisdiction of up to €75,000. Regarding personal injury actions,2 the revised jurisdiction limit of the Circuit Court is restricted to €60,000. Any amount exceeding €75,000 falls within the remit of the High Court. The Legal Services Regulation Bill 2011 was published in October 2011 and proposes the unification of the legal professions of solicitor and barrister (multi-disciplinary practices or ‘MDPs’). It remains unclear whether the Bill will be implemented and, if so, when. In December 2014, it was announced that the proposal will be subject to six months of research followed by six months of public consultation. It is anticipated that the new Legal Services Regulatory Authority will become operational in the first half of 2015, after which the research period will begin. Civil proceedings in the District Court, Circuit Court and High Court are initiated by issuing a warning letter to the defendant, prior to commencing proceedings, setting out the basis of the plaintiff’s claim and requiring an admission of liability. a Actions under contract and tort, and claims for rent arrears: six years from the date on which a cause of action accrues. b Actions upon an instrument under seal, and for the recovery of land: 12 years from the date on which the cause of action accrues. c Actions under a claim for personal injuries: two years from the date on which a cause of action accrues or the date the claimant first had knowledge, if later. d Actions for defamation: one year from the date of publication of the defamatory statement. a Actions are initiated by way of plenary summons, which broadly sets out the plaintiff’s claim and the relief being sought. b The defendant then enters an appearance to signal a willingness to defend the claim. This also serves to cure any defects in respect of service. Extended time is given to defendants outside the jurisdiction to enter an appearance. c The plaintiff then delivers a statement of claim setting out the nature of the claim. d A notice for particulars is usually raised on this statement of claim seeking more detailed information – by way of replies – on the claim. e The defendant delivers a defence. At this juncture, any application to bring in a third party will usually be made. The plaintiff may deliver a reply to the defence. f The parties will then commence the discovery process, discussed further below. g In the event that a party has defaulted in delivering a pleading or adequately dealing with a discovery request, a motion can be brought compelling its delivery or a response, which will have costs consequences for the party in default. h Once discovery has been completed then either party is at liberty to serve the notice of trial. A typical non-jury case may take at least 12 months to obtain a hearing date. Cases are usually heard by one judge and without a jury, except for defamation and civil assault claims. The High Court has increasingly assumed an active case management role, which will vary the above time frames. This has been influenced by the success of the Commercial Court, whose main objective is to hear complex commercial disputes as efficiently as possible, pursuant to Order 63A of the RSC. Parties must comply strictly with the time frames set down by the Commercial Court for the exchange of pleadings, witness statements, case summaries, submissions and agreed booklets of documents. Significant cost penalties are imposed on any party that does not comply with the prescribed time frames. On average it is taking 30 weeks from entry into the Commercial Court list to judgment. Therefore, depending on the urgency of the case and the number of issues to be dealt with, it is possible to have cases resolved very quickly. Interim injunctive relief is available from the High Court and parties may seek prohibitory or mandatory injunctions. The most common mandatory injunctive reliefs are quia timet (to prevent imminent irreparable harm occurring); Mareva injunctions (freezing orders); and Anton Piller orders (search of the other party’s premises and the removal of certain identified material). Application for interim injunctive relief is made on an ex parte basis, and can be brought on an emergency basis. If the interim order is granted, it will generally be for a limited number of days until the interlocutory hearing when the plaintiff will seek a continuation of the order. The defendant must be on notice of this interlocutory hearing. Recourse to class actions is restricted in Irish law. In particular, the courts are wary of allowing plaintiffs to represent large bodies of persons who have not consented to such representation lest their constitutional right of access to the courts be frustrated. Representative actions are permitted by the RSC. Order, 15 Rule 9 provides that where numerous persons have the same interest in a cause or matter, one or more of those persons may sue or be sued on behalf of or for the benefit of all interested parties. The representative plaintiff must be duly authorised to sue on behalf of each individual party, and evidence of same must be presented to the court before a representative order will be made. Any decision of the court will, in the absence of fraud or other special circumstance, bind all interested parties to the action. Similar provisions are to be found in the Circuit Court Rules.3 Such actions are a rarity in Irish law. Test cases may also be brought whereby a small number of cases are selected from a group of cases that arise from the same circumstances. While the results of these cases are not binding on the parties in the other cases unless there is an agreement in place, test cases have a persuasive value under the doctrine of precedent. Parties (including natural and legal persons) are usually represented by solicitors and barristers (senior or junior counsel). A company must be legally represented and cannot be represented in court by its officers or servants. In the Circuit Court the parties will only be represented by a solicitor and one junior counsel, whereas in the High Court the parties will also have at least one senior counsel. Alternatively, lay litigants have full rights of audience. In exceptional circumstances, the courts have allowed a lay litigant to be represented by an unqualified advocate. In Gabriel Coffey v. Tara Mines Ltd,4 the High Court relied on its inherent jurisdiction to manage court proceedings, and in consideration of the nature of that case permitted the spouse of a lay litigant (who had communication difficulties due to ill health) to represent him in the proceedings. Service is effected in compliance with Irish law, for example, personal service is required where reasonably practicable. However, service in accordance with Irish law only guarantees that any judgment obtained will be enforceable in Ireland. To ensure enforceability in another country, service must be effected in accordance with the law of that state. Regulation (EC) No. 1393/2007 and the Hague Convention of 15 November 1965 on the Service Abroad of Judicial and Extrajudicial Documents in Civil or Commercial Matters (the Hague Convention) provide that service will be effected in accordance with the law of the destination country. Where the destination country is not governed either by Regulation (EC) No. 1393/2007 or the Hague Convention, service is in accordance with Irish procedural rules. Service on a company is generally effected by delivering the document or sending same by registered post to the company’s registered office. For partnerships, service is effected by serving one or more of the partners at the partnership’s principal place of business. Where the person to be served is not an Irish citizen, a notice of summons and not a summons itself should be served. Enforcement and recognition of foreign judgments between Member States (excluding Denmark) is governed by Regulation (EC) No. 44/2001 on Jurisdiction and the Recognition and Enforcement of Judgments in Civil and Commercial Matters (the Brussels I Regulation). Regulation (EU) No. 1215/2012 on Jurisdiction and the Recognition and Enforcement of Judgments in Civil and Commercial Matters (recast) (the Recast Regulation) will be applied by all Member States (including Denmark) from 10 January 2015.5 The Brussels I Regulation will be repealed,6 except that it will continue to apply to judgments given in proceedings instituted before 10 January 2015.7 The Brussels Convention (which the Brussels I Regulation supersedes) still applies to Denmark and also territories in Member States that are excluded from the Brussels I Regulation. The Brussels II Regulation8 applies in respect of Jurisdiction and the Recognition and Enforcement of Judgments in Matrimonial Matters and the Matters of Parental Responsibility (except in Denmark). The Lugano Convention 2007 continues to apply in parallel to the Brussels I Regulation and applies as between Member States and members of the European Free Trade Association. A parallel method of enforcement of Member State judgments and orders is provided by Regulation (EC) No. 805/2004, which creates a European enforcement order for uncontested claims. This allows a party to have a judgment certified as a European enforcement order in a Member State that is automatically recognised and enforced in another Member State without the need for the judgment creditor to take any intermediate steps. To enforce a Member State judgment in Ireland, an application must be made, by way of a motion grounded on affidavit, setting out the objective measures requested, on an ex parte basis to the Master of the High Court. The procedures are set out in Order 42A of the RSC.9 To enforce a judgment from a non-EU or EFTA country for a liquidated sum, new proceedings for the recovery of a simple contract debt must be commenced in Ireland by way of summary summons pursuant to the Irish common law rules of enforcement. There are a number of prerequisites to be met under Irish common law for enforcement of a non-EU or EFTA judgment: the judgment must be (1) for a definite sum, (2) final and conclusive and (3) given by a court of competent jurisdiction. On 15 April 2008, Regulation (EC) No. 1206/2001 on Cooperation between the Courts of the Member States in the taking of Evidence in Civil or Commercial Matters came into effect in Ireland with the enactment of the European Communities (Evidence in Civil or Commercial Matters) Regulations 2008 (the 2008 Regulations). The 2008 Regulations were revoked by the European Communities (Evidence in Civil or Commercial Matters) Regulations 2013 except insofar as the 2008 Regulations will continue to apply to requests made before the commencement of the new Regulations. The 2013 Regulations facilitate the taking of evidence in one Member State at the request of another Member State court. This request must be in the official language of the place where the evidence is to be taken. The requested court must acknowledge the request and execute it within 90 days. On 1 September 2008, the 2000 EU Convention on Mutual Assistance in Criminal Matters was finally implemented into Irish law by the enactment of the Criminal Justice (Mutual Assistance) Act 2008 (the 2008 Act). Parts 4 to 6 of the 2008 Act set out provisions in relation to the mutual recognition and enforcement of freezing orders and the taking of evidence and service of proceedings in criminal matters. All requests for assistance must be in writing, addressed to the Minister for Justice, Equality and Defence and must indicate the relevant international instrument under which the request is being made. The Courts Service website10 records details of parties in dispute and the stage of the pleadings. Copy pleadings are not made available. There is no such search mechanism for the lower courts. Order 123 of the Rules of the Superior Courts (Recording of Proceedings) provides for the procedure regulating applications for access to a record of court proceedings (i.e., a transcript). Rule 9 states that any party or person who seeks access to a record of proceedings may apply to the court by motion on notice to the other party or the parties to those proceedings, grounded on affidavit. The court may, where it considers it necessary in the interests of justice so to do, permit the applicant to have such access to all or such part of the relevant record. Members of the public may attend all court hearings, except in camera proceedings,14 which generally relate to family law matters, those involving minors or certain proceedings brought under data protection legislation. The decision of Mr Justice Clarke in Thema International Fund plc v. HSBC Institutional Trust Services (Ireland) Limited & Ors,15 confirmed that maintenance and champerty were still prohibited under Irish law. ‘Maintenance’ is where an individual, without a legitimate interest, funds the litigation of another. Champerty is a subset of maintenance and arises where an individual provides maintenance in return for a share of the proceeds. The only form of third-party funding that is acceptable in Ireland is that provided by a third party that has a legitimate interest in the outcome of the litigation. Mr Justice Clarke in the Thema case (referring to his own judgment in Moorview Developments Ltd v. First Active plc)16 implied that bona fide creditors and shareholders may fund legal actions on the basis that then they are funding a company in which they have a legitimate interest in the hope that the company will be able to pay them the monies due (creditors) or dividends or capital distributions (shareholders). Where a third-party funder has funded litigation on behalf of an impecunious party, the Irish courts have jurisdiction to make an order for costs against that third party. In terms of payment of costs, although the courts have a discretion as to how costs are to be awarded following the hearing, the general rule is that costs follow the event, namely that the unsuccessful party will pay the costs of the successful party. Actual or perceived conflicts of interest are governed in Ireland by the Law Society’s Guide to Professional Conduct of Solicitors in Ireland (the Ethics Guide), which provides that where a conflict of interest exists between the interests of a solicitor and those of his or her client, the solicitor must not act for the client. If the conflict arises during the course of a transaction, the solicitor must cease to act for that client. The Ethics Guide deals with the situation where a conflict of interest arises between two clients in a matter in which a law firm is acting for both. In such a scenario, the Ethics Guide provides that the firm must cease to act for either client in that matter. In exceptional circumstances in non-contentious matters one of the clients may consent to the other client remaining, for example, in a situation where the firm acts for more than one party in a commercial transaction such as an acquisition (see ‘Chinese walls’ discussed below). The Ethics Guide is silent on the issue of Chinese walls, which are permissible in Ireland and are common in the larger Irish law firms. Where a law firm acts for more than one party to a commercial transaction they must notify both parties and put in place a strict Chinese wall procedure. The Criminal Justice Act 1994 (as amended) imposes obligations on certain bodies for the purposes of preventing laundering of money. Directive 2001/97/EC sought to extend these obligations to professional advisers such as accountants and solicitors. This Directive was implemented in Ireland by the Criminal Justice Act 1994 (Section 32) Regulations 2003 (the 2003 Regulations). On foot of these Regulations, there are now obligations on Irish solicitors to establish the identity of their clients; maintain records of transactions; introduce staff training in respect of money laundering; and introduce internal reporting in respect of money laundering and make reports of suspicious transactions to the Garda Síochána and to the Office of the Revenue Commissioners, as appropriate. Solicitors are subject to severe sanctions, both fines and imprisonment, if they breach any obligations under the 2003 Regulations. In line with the Directive, the Criminal Justice (Money Laundering and Terrorist Financing) Act 2010 (the 2010 Act) came into operation on 15 July 2010, repealing the 2003 Regulations. This was most recently amended by the Criminal Justice Act 2013. The 2010 Act (as amended) adopts a ‘risk-based’ approach to the client identification rules. Firms should assess the risk of money laundering occurring at the beginning of the relationship and monitor this risk throughout the duration of the relationship. The 2010 Act (as amended) requires firms to adopt a ‘customer due diligence’ standard as opposed to the pre-existing ‘know your client’ rules. Data Protection is governed by the Data Protection Act 1988 as amended, among others, by the Data Protection (Amendment) Act 2003 (the DPA), which transposes Directive 95/46/EC on data protection into Irish law. The laws apply to individuals or organisations established in Ireland that collect, store or process data about living people on any type of computer or in a structured filing system and regulate the processing of data that is broadly defined to encompass the performance of any operation in relation to information or records, either automatically or otherwise. Processing personal data is fundamental to legal practice, and all practitioners must comply with the DPA. There are eight fundamental principles that apply to all data controllers, including the obligation that personal data is only kept for one or more specified, explicit and lawful purposes, and that personal data is kept safe and secure. • the satisfaction of statutory obligations or public services. Special obligations apply to the processing of sensitive personal data. The DPA provides for exceptions to consent requirements for the processing of personal data, which includes where the processing is required for the purposes of obtaining legal advice or for the purposes of, or in the course of, legal proceedings in which the person making the disclosure is a party or a witness. While there are registration requirements for data processors and controllers, a wide exemption is available for normal commercial activity including solicitors and barristers who only process data for legal professional purposes. Personal data cannot be shared or transferred without the consent of the individual involved. Further, personal data cannot be transferred to a country or territory outside the European Economic Area unless that country or area ensures an adequate level of protection for the rights and freedoms of data subjects in relation to the processing of personal data. Privilege in Ireland is governed by the common law. The main recognised categories of privilege are as follows. This head extends to include two distinct categories of communication between a lawyer and a client: legal advice privilege and litigation privilege. The term ‘lawyer’ includes solicitors, barristers, foreign lawyers and in-house counsel (although the position of in-house counsel is affected by the decision in the Akzo Nobel case referred to below). Confidential communications (which have a broad interpretation and include draft notes and electronic documents) between a lawyer and a client for the sole purpose of giving or seeking legal advice are subject to legal advice privilege, provided the communications took place in the course of a professional legal relationship. Legal assistance, on the other hand, does not benefit from privilege. In Fyffes v. DCC & Ors20 the High Court applied the principles laid down in Smurfit Paribas Bank Limited v. AAB Export Finance Limited21 and found that communications from the plaintiff’s solicitors in response to a letter of complaint from the plaintiff’s shareholder brought the plaintiff into the area of possible litigation and afforded the documents legal advice privilege. In Ochre Ridge Ltd v. Cork Bonded Warehouses Ltd,22 the Irish High Court ruled that legal advice privilege does not extend to advice of a legal nature provided on business matters. The decision of the European Court of First Instance in Akzo Nobel Chemicals Ltd and Akcros Chemicals Ltd v. European Commission23 makes it clear that, in relation to European Commission competition investigations, communications between in-house lawyers and their internal clients are not entitled, in certain circumstances, to the same protection or privilege as communications between a company and its external lawyers. Confidential communications made in contemplation of litigation or after litigation has commenced between a lawyer and a client or third party for the sole purpose of the litigation fall into this category of privilege. In this regard, all communications between a party and his or her legal advisers or with third parties (such as potential witnesses or experts) or internally, which are created predominantly for the purposes of or in contemplation of litigation, are privileged. This type of privilege also attaches to the work product of the parties’ legal advisers such as draft pleadings for the case, notes or memoranda. This protection can only be waived with the agreement of both parties. Confidentiality and privilege are particularly vital for the proper functioning of an ADR regime. The European Communities (Mediation) Regulations 2011 (the 2011 Mediation Regulations) expressly provide that any person involved in a mediation that is governed by these Regulations shall not be compelled to give evidence in civil or commercial proceedings relating to a matter arising out of, or connected with, mediation. Such parties may be compelled to give evidence in situations where non-disclosure of the information would be contrary to public policy. Most communications made in the course of mediations will of course attract without prejudice privilege as well as this added statutory protection. This privilege exists where another party along with the lawyer’s client has a common interest in the subject matter of the privileged communication. The existence of this privilege was recognised by the High Court in Moorview Developments Ltd & Ors v. First Active plc & Ors25 The effect of common interest privilege is that the documents will remain privileged, notwithstanding their release to a third party. In the recent case of Redfern Limited v. O’Mahony26 the Supreme Court confirmed that legal privilege will not be lost where there is limited disclosure for a particular purpose or to parties with a common interest. Further, the Supreme Court confirmed that there is no general principle whereby legal professional privilege in documents is waived by putting in issue allegations to which the privileged documents are relevant. It is unclear whether an Irish court would enforce a foreign order for disclosure of a document where to do so would contravene Irish law. There has been no recent case law on this point; however, assuming the Irish courts were to follow the English decision of X AG & Others v. A Bank,28 such a foreign order for disclosure of a document that was privileged under Irish law would not be enforced by the Irish courts. Discovery is the process by which one party to civil proceedings obtains the disclosure of documents from another party or from a non-party in advance of a trial. Discovery in High Court actions is governed by the RSC and the obligations are more onerous than those in the Circuit Court and District Court where a request for general discovery of ‘all documents relevant to the issues in dispute in the case’ can be made. In High Court actions, however, there is a requirement that parties seeking discovery must specify precise categories of documents that they require and provide reasons why they are relevant and necessary. The meaning of what constitutes a ‘discoverable’ document was supplemented by the Rules of the Superior Courts (Discovery) 2009 (the 2009 Discovery Rules) to include documents ‘necessary for disposing fairly of the cause or matter or for saving costs’. A party is obliged only to discover those documents relevant to the categories agreed or the court order that it has or has had in its ‘possession, power or procurement’.29 The party applying to the court for discovery must show on affidavit that the discovery sought is relevant and necessary to dispose fairly of the matter or to save costs. The RSC do not prescribe a definition of ‘document’; however, the term has been broadly defined in case law as meaning anything containing information. This includes any document in writing, handwritten notes, maps, drawings, photographs, discs, computerised or electronically stored information. Relevance of the documents is determined with regard to the pleadings. The courts have expressly reserved the right to decide whether documents are relevant and, if appropriate, the courts will examine the documents to ascertain their relevance. Necessity is also decided by the courts on the specific facts of each case.30 The Commercial Court decisions in Flogas Ireland Limited v. Tru Gas and Flogas Ireland Limited v. Langan Fuels Limited31 makes clear that any discovery of confidential or commercially sensitive documents will require a full and detailed explanation as to why these documents are relevant and necessary to the pleadings. Even so, depending on the documentation involved, the court may decide that the balancing of rights demands an order against discovery. Pursuant to the 2009 Discovery Rules, a party may seek electronic data from its opponent and a court may order a party to give inspection and search facilities for electronic data on its computer systems. The fact that a document is situated outside the jurisdiction does not preclude it from being discoverable. It is possible to seek discovery against a non-party. A party seeking such an order should indemnify such person and pay their costs. Reference to arbitration is commonplace in commercial contracts. However, as arbitration becomes increasingly formalised and thus more akin to traditional adversarial proceedings, there is an increasing trend towards consent-based non-binding forms of alternative dispute resolution (ADR) such as mediation and expert determination as more flexible and cost-efficient ADR mechanisms. The Arbitration Act 2010 (the 2010 Act) came into operation on 8 June 2010, repealing all previous arbitration legislation in Ireland. The 2010 Act incorporates the UNCITRAL Model Law (the Model Law) and applies to all domestic and international arbitration commenced after 8 June 2010.
f the award is in conflict with the public policy of the state. The New York Convention on the Recognition and Enforcement of Foreign Arbitral Awards 1958 (the New York Convention) applies in Ireland and an award made in the territory of the state that is party to the New York Convention shall be enforceable in the same manner in Ireland as the award of an arbitrator made in a domestic arbitration. The New York Convention has been overtaken in Ireland by the incorporation of the Model Law into Irish law on foot of the Arbitration (International Commercial) Act 1998. A party may seek to have an arbitral award recognised and enforced regardless of whether it has been made in a signatory or non-signatory country, subject to that country having adopted the Model Law. To enforce an award, application may be made to the High Court by way of originating notice of motion grounded on affidavit exhibiting the original arbitration agreement and the award (together with a translation of same). Enforcement will only be refused on limited grounds such as where it would be contrary to public policy. However, in Broström Tankers AB v. Factorias Vulcano SA,32 the High Court held that the public policy defence was of narrow scope and could only be invoked where there was some element of illegality or where enforcement of the award would be clearly injurious to the public good or wholly offensive to the public. There are no specific rules governing the conduct of mediation in Ireland for purely internal disputes. As mediation in Ireland is a relatively new concept, there is a relatively small but growing group of individuals who have trained to act as professional mediators. Mediation institutions such as the Mediators’ Institute of Ireland, the Centre for Effective Dispute Resolution and the Irish Commercial Mediation Association promote mediation by offering training, advice and, in many cases, a link to a panel of mediators. The Law Society of Ireland also has a panel of accredited mediators. Mediations have become the increasingly favoured form of ADR because of the support of the Commercial Court judges. In addition, there is explicit legislative support for mediation in equality legislation, and landlord and tenant disputes through the Private Residential Tenancies Board (PRTB), which was established under the Residential Tenancies Act 2004. In addition to mediation, the PRTB offers adjudication via a single adjudicator as an ADR mechanism. The 2011 Mediation Regulations transposed European Directive 2008/52/EC on Certain Aspects of Mediation in Civil and Commercial Matters (the 2008 Directive). There are separate rules applicable to mediations in relation to internal disputes and mediations in cross-border disputes. This bifurcation of the rules applicable to mediations in Ireland is unfortunate, especially considering those aspects of the 2008 Directive that would tend to actively encourage recourse to mediation, namely the suspension of the limitation period during the mediation process and the confidentiality of discussions at mediations. One must not, however, overstate the matter. One of the principal novelties of the 2008 Directive was to permit a court to adjourn proceedings and either to invite the parties to consider mediation or to refer the proceedings to mediation where there is an agreement between the parties. This option is already open to the High Court in internal disputes by virtue of the Rules of the Superior Courts (Mediation and Conciliation) 2010 (the RSC (Mediation and Conciliation) 2010).33 The option of adjournment to allow the parties to consider ADR has also been open to the Commercial Court since its inception in 2004. The provisions in the 2008 Directive allowing for settlement agreements to be enforceable as if they were court orders differ slightly from the general rule in Irish law that settlement agreements are, as a matter of contract law, valid and enforceable and a party may be ordered to specifically perform any obligations arising therefrom. In a purely internal matter, the parties are obliged to apply to take proceedings in order to enforce their settlement agreement. The regime under the 2011 Mediation Regulations allows for the parties to simply apply to court and have the terms of the agreement reflected in an enforceable court order. The opportunity to avoid the burdensome costs of litigation is an attractive feature of mediation. As such the RSC (Mediation and Conciliation) 2010, mentioned above, sought to encourage the use of mediation to resolve disputes by providing that in awarding costs, the court may take into account any party’s refusal or failure to participate in mediation or conciliation in circumstances where there was no good reason for such refusal or failure. This provision was considered in the recent case of Hollybrook (Brighton Road) Management Company Limited v. All First Property Management Company Limited34 where Ms Justice Laffoy refused to give any weight to a refusal by one party to a dispute to consider ADR in assessing the parties’ liabilities for costs. This approach was legally sound as the court had made no order adjourning the proceedings and inviting the parties to mediate the dispute but had simply suggested it as an option. It is possible however that in an appropriate case, the refusal to engage in ADR where the court has suggested it as an option could have some bearing on the allocation of the burden of costs between the parties. The most recent development in Irish mediation is the publication of a Draft General Scheme of Mediation Bill in March 2012 (the Scheme). The Scheme provides for a number of matters including the imposition of a new statutory duty on solicitors to advise their clients, prior to the commencement of civil proceedings, of the possibility of using mediation and a requirement that the solicitor provide the client with information concerning mediation services; and before proceedings are issued, they must be accompanied by a written statement from the plaintiff confirming that they have been advised of mediation, and that they have considered this as an option for settling the dispute. The Scheme also refers to the necessity of having a mediation agreement in place between the parties, which should be enforceable and seeks to introduce a statutory basis for the courts to invite parties to consider mediation and adjourn court proceedings while mediation is ongoing. This latter element echoes existing procedures in the court rules. Publication of the Mediation Bill has been delayed but it is anticipated that it will be enacted in the first half of 2015. Expert determination and adjudication have been most often utilised in specialist disputes, for example, construction industry disputes. Reference to expert determination is usually also included in agreements for lease in the context of rent review disputes. In terms of outlook generally, we believe that this jurisdiction will continue to see an expansion of disputes in relation to financial and regulatory matters. The continued expansion of such disputes will put pressure on the Irish courts and, in particular, the Commercial Court; however, this specialist court has proved itself very effective in continuing to ensure that significant disputes are efficiently resolved, notwithstanding the expansion of its caseload, and we expect that this will remain the case in the coming year. It is anticipated that the new Court of Appeal Act will have a significant impact on the current appeal waiting lists and will greatly improve the overall efficiency of the Irish court system. Increasingly, mediation clauses are included as part of the dispute resolution mechanisms in commercial contracts. This success of mediation is undoubtedly being encouraged by legislative backing and strong judicial support. 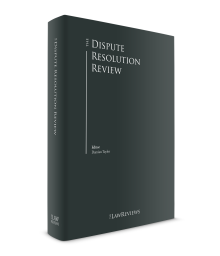 It is anticipated that when the Mediation Bill comes into force the rules of civil procedure will be further revised to embed mediation as an increasingly utilised fixture within the legal system. The continued and increasingly prevalent use of ADR as an alternative to litigation should also ease the burden on the courts system and ensure that Ireland retains efficient and flexible dispute resolution mechanisms. 1 Andy Lenny is a partner and Peter Woods is an associate at Arthur Cox. The information contained in this chapter is accurate as of February 2015. 2 As defined in Section 2 of the Civil Liability and Courts Act 2004. 3 Order 6, Rule 10. 6 Article 80 of the Recast Regulation. 8 Regulation (EC) No. 2201/2003. 9 Certain procedural amendments in respect of proceedings issued pursuant to the Lugano Convention and Brussels II Regulation were introduced by SI No. 307/2013, Rules of the Superior Courts (Lugano Convention, Maintenance and Service) 2013 and SI No. 311/2013, District Court (Maintenance and Lugano Convention) Rules 2013 (both came into operation on 26 August 2013). 12  IEHC 242. This decision is currently under appeal. 13 See also Ewing v. Ireland & Anor  IESC 44 (No 2). 14 Part 2 of the Courts and Civil Law (Miscellaneous Provisions) Act 2013 modified the in camera rule to grant bona fide representatives of the press access to family law and child care court proceedings. There are strict reporting rules imposed on attendees, including a prohibition on the publication of material likely to lead to the identification of the parties or any child to whom the proceedings relate. 19 The Solicitors (Professional Practice, Conduct and Discipline – Conveyancing Conflict of Interest) Regulation 2012 prohibits solicitors from acting for both sides in a commercial property transaction subject to certain exceptions. 28  2 All ER 464. 29 Order 31 Rule 12 (1) RSC as amended by SI No. 93 of 2009. 30 Hogan v. McAteer & Others, 28 June 2002, Master’s Court (unreported); Cooper Flynn v. Raidió Teilifís Éireann  3 IR 344; Framus Ltd v. CRH plc  IESC 25.